My husband or I always read books to our kids before bed. But sometimes, we need a reminder that you don’t even need a book for a good bedtime story. As a very young child, my bedtime stories didn’t come from a page. Nor were they the fairy tales and nursery rhymes familiar to most American tots. My father told the stories — mostly the same folk tales he heard as a young boy in Taiwan. One of my favorites was the legend of the Peach Boy. It is a story similar to the Japanese folk tale Momotaro, which literally translates into Peach (momo) Son (taro). From the late 1800’s until the end of World War II, the island of Taiwan was under Japanese occupation. The northern country’s influence can still be seen in many aspects of Taiwanese society: food, pop culture, and education. The tale of Momotaro starts out with an elderly couple who yearn for children but are getting on in their years (sort of the Asian equivalent to the Judeo-Christian Abraham and Sarai). The old lady is washing clothes in the river one day, when a peach — the biggest, most beautiful peach she has ever seen — comes floating downstream. She takes the fruit home to her husband, and they slice it in half. Out pops a beautiful little baby boy, and against all odds they are parents . That is the way I remember the story, at least. As an adult, I learned there is another rendition of Momotaro. Curious about the peach, the old woman takes a bite of the fruit, and overcome by the luscious ripeness, she is transformed into a beautiful maiden. (Maybe this is an Eastern corollary to Adam and Eve?) The newly rejuvenated woman goes home to her husband, who does not recognize her, yet is overcome by passion and takes her to bed. In turn, the old man also becomes young again, and his wife becomes pregnant with their son. Either way, Momotaro the Peach Boy grows up to be warrior, who with — the help of a talking dog, monkey and pheasant — liberates the island of Onigashima from its native demons. 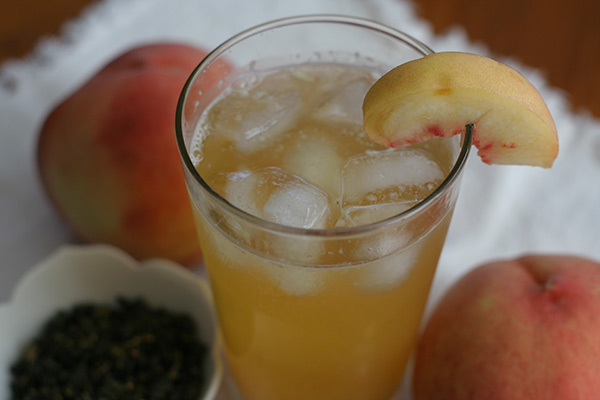 Ripe peaches and freshly brewed iced tea are some of summer’s simple pleasures. Here, the two are mixed together in a refreshing drink that is nothing like those syrupy bottled drinks that call themselves peach tea. 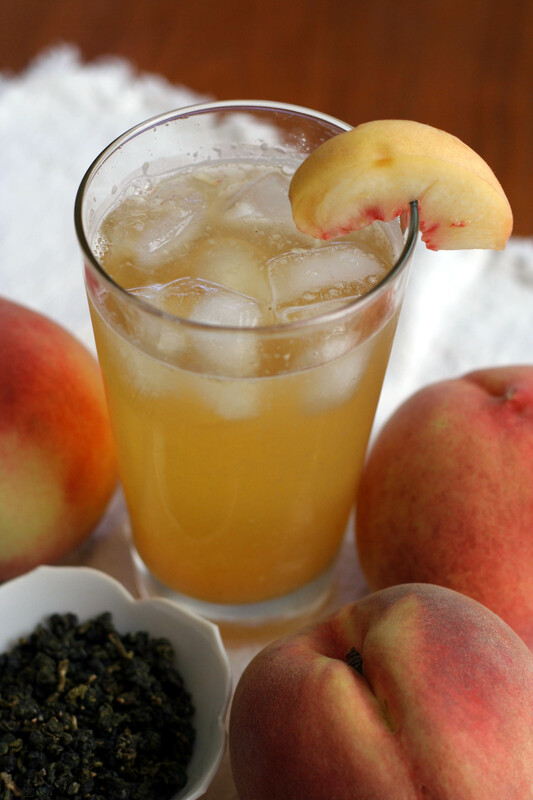 Oolong tea, with its golden color and floral aroma, pairs well with the fruit. If necessary, you can substitute green tea. Put the oolong tea leaves in a teaball or wrap in cheesecloth to form a sachet. Or use an iced tea pitcher with a built-in strainer for leaves. Place teaball or sachet into pitcher. Pour cold water over the tea leaves. Steep for 3-5 hours at room temperature. While tea is steeping, peel peaches and cut into chunks. Reserve a few slices for garnishing. Using a food processor, puree the peach chunks. Add sugar, if peaches are not especially sweet. Remove tea leaves from pitcher. Add peach puree and stir. The tea will be pulpy, not clear. Congratulate yourself for not drinking one of those overly sweet tea-like beverages! My friend Larissa recommended this book, for a more thorough recounting of the Peach Boy story.